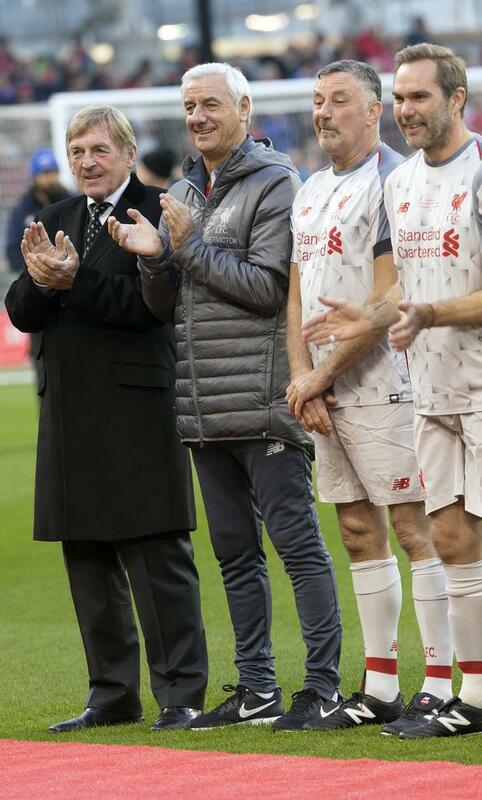 Sean Cox was spotted with a huge smile on his face as he met Liverpool legend, Kenny Dalglish and Ireland boss Mick McCarthy. 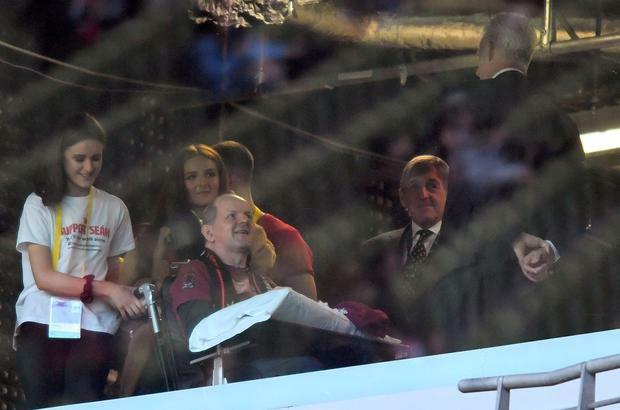 Mr Cox spent his first time out in public cheering on his beloved Reds in front of 26,873 supporters. Dalglish led a star-studded Liverpool team against Ireland stars of yesteryear, managed by current international boss Mick McCarthy, and featuring Robbie Keane, Sean St Ledger, Ray Houghton and a host of other big names. 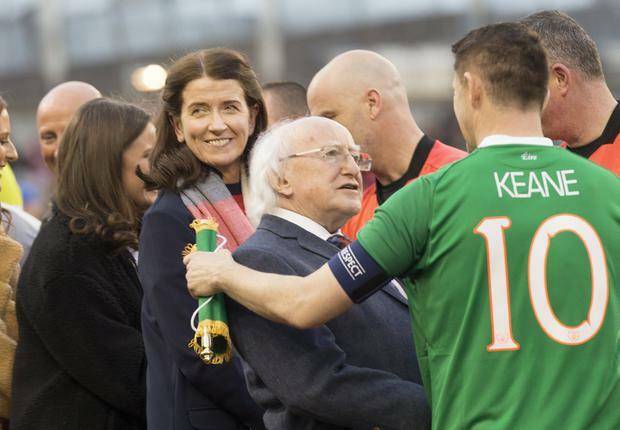 Irish President Michael Higgins attended the game and met Mr Cox's wife, Martina and children Jack, Shauna and Emma on the pitch, as thousands of fans sang Liverpool anthem You'll Never Walk Alone. As she walked onto the pitch, mother-of-three, Martina held back tears as she embraced the special moment. A statement from Mr Cox's wife Martina read: "The last 12 months have not been easy for us, but what has helped us get through this difficult journey has been the outpouring of support and genuine concern for Sean. "For this we will always be thankful. We are filled with gratitude and feel truly blessed. "A heartfelt thanks to everyone involved in this special day, it will stay with us for a very long time." It took a lot of preparation from the Cox family and his medical team to ensure he could make it to the Aviva, but judging by the success of last night’s event it was all worth it. "It's a big milestone for us,” Ms Cox said earlier this week. “He has been out of hospital for a couple of hours before, but this is him out in the public arena for the first time. "It will be quite overwhelming for Sean. He's been home but only in our house, and he's been with family. 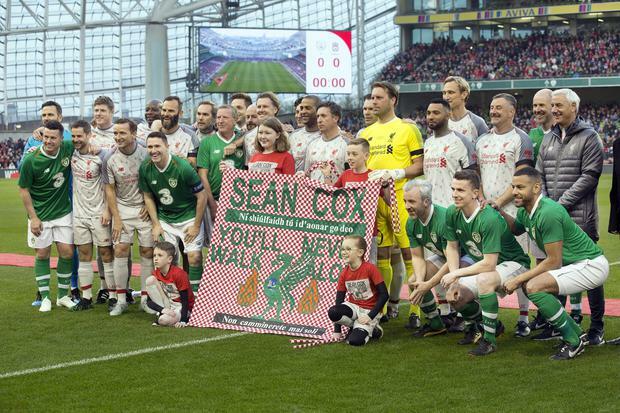 The star-studded players of both Ireland and Liverpool accompanied the fans as they sang a moving rendition of ‘You’ll Never Walk Alone’. It is nearly a year since Sean Cox suffered major head trauma when he was struck in a random assault by a masked AS Roma supporter outside Liverpool's stadium last April. Irish legend Robbie Keane said it was a fate that no person or their family should ever endue. 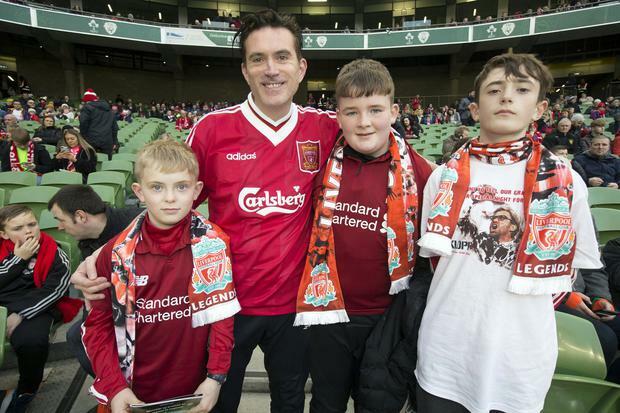 “You go to a football match to enjoy the day, enjoy the game and support your team,” he said. “So, for something like that to happen was absolutely awful. You can’t change what happened but football does have a great way of bringing people together in times like this. “It’s a chance for myself and every one of the players and coaches involved to show how much we are supporting Sean and his family in any way we can,” he said. 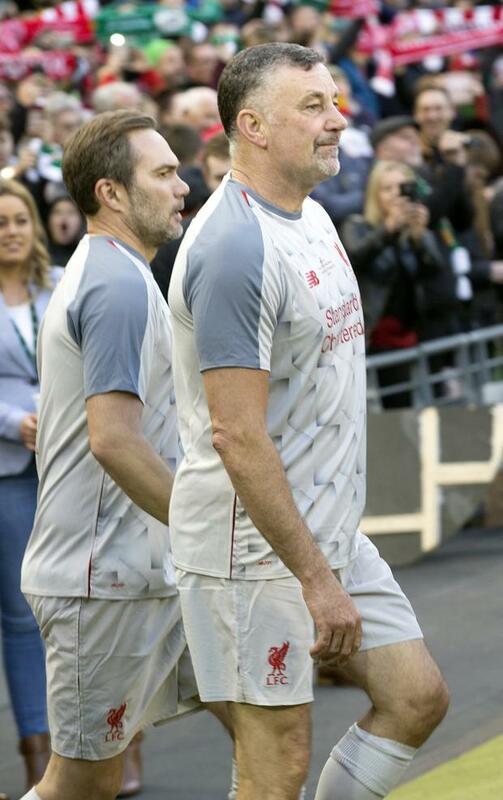 The Liverpool Legends team, managed by Kenny Dalglish and captained by Ian Rush, played an Irish Republic Legends side yesterday, which was managed by Mick McCarthy and captained by Robbie Keane. The game featured a host of famous players including John Aldridge, Ronnie Whelan, Jason McAteer, Ian Rush, Robbie Fowler and Phil Babb. All the funds raised on the night went towards the Sean Cox Rehabilitation Fund, which has amassed more than €1m already. And nearby pub Slattery’s in Beggar’s Bush did their bit to help last night by donating a euro from every pint to the fund. Mr Cox addressed the public for the first time this week and offered a message of thanks to the thousands of people wishing him well. The Sean Cox Rehabilitation Trust released video of the Dunboyne father thanking the public and giving a thumbs up. "If you are one of the thousands who organised/attended a fundraiser to support Sean, Sean Cox has a message for you," the charity said. Following Mr Cox’s discharge from the National Rehabilitation Hospital in Dun Laoghaire, the family are now considering continuing his treatment in the UK. However, the ultimate ambition, they say, is to get the him home to Dunboyne; which will see the Cox’s home needing major re-adjustment and specialist medical equipment, along will ongoing nursing and therapist support. Professor Mark Delargy at the National Rehabilitation Hospital [NRH] said this week that Mr Cox is doing “remarkably well”. “Family and visitors will have seen Sean’s recovery advance from those early weeks when nothing seemed to be happening,” he said. “His rehabilitation team has the job of helping him on the road to making the best recovery possible. “As the months go by although the recovery is very slow, improvements are emerging. Mr Delargy added that Mr Cox’s recovery is dependent on the amount of speech, occupational and physical therapy he can get at the NRH. “Recent rehabilitation research points to Sean needing as much skilled neurorehabilitation as he can manage, for as long as it is helping him - months and months of it. “And funding that skilled rehabilitation resources for people with brain injury. Many people would benefit from high intensity rehabilitation but there just aren’t enough skilled teams in the public service to meet the demand. “There is a significant monetary requirement to provide Sean with the long term, high quality, effective rehabilitation he will need after NRH.